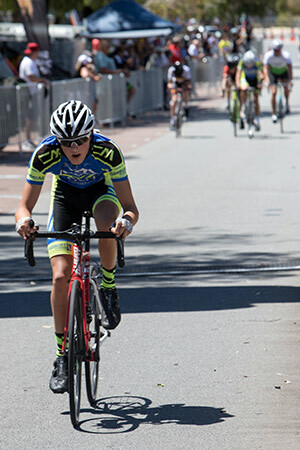 Sunday afternoon saw criterium racing take over the Mandurah foreshore with the first round of the Ring series. With the American national track cycling visiting Perth, Men’s A grade had a truely international flavour, with five American riders including two who had won the American National Criterium Championships on multiple times, lining up. The Americans rode as a team and controlled the race, whenever a break went of the front, they always had a rider in it. As soon as the other riders brought the break back, another would go, and that had an American in it. The suddenly one of their team Colby Lange was off the front alone. Riders tried to bridge and while they let individual riders attempt and fail, they made sure they followed every attack with more than one rider. After an hour of racing Lange won convincingly. Luke Bates was the best placed Australian, after multiple attempts, Bates go into a chase group of three, which did claw back some of the gap, a crash in the closing stages saw Bates the sole survivor and finished second. Tim Sellar sprint out of a very reduced bunch to claim third. Women’s A grade was a tactical race, with the stronger riders attempting to dislodge the faster finishers with aggressive riding. While a couple of fast finishers were dropped, Former HockeyRoo Teneal Attard was very attentive at the front of the race. Coming out of the last corner with 600 metres to go Attard attacked and held her advantage to take the win. Jade Haines was second and Dharlia Haines third. Men’s B grade was another aggressive race, with riders constantly attacking and getting small break. The big bunch was always chasing and bringing them back. As the race wore on, the bunch was getting smaller and smaller, but the same riders kept attacking and the same riders kept chasing. In the reduced bunch sprint it was Josh Commons first, Adrain Paul second and Paul Foxwell third. Women’s B grade followed a similar script, with riders attacking, the bunch chasing. At times it looked like the break might make it, only to be brought back. In the sprint it was Emily Wiggins first, Jessica Lawler second and Darcie Richards third. Paul Prottey claimed he could not corner or sprint, though he does time trial well (He was second fastest rider in the morning time trial at Hopeland). Prottey tactics in Mens’ C grade were simple, ride at the front for the first couple of laps, go through the corners at his own pace and stay out of trouble. A moments hesitation and Prottey had a small gap, which he quickly made bigger. As the gap grew and the chase behind became disorganised, riders attempted to bridge across solo, two made it. But they spent too much energy riding across and could not hold Prottey’s wheel. In the end Prottey was a convincing winner. Matthew Gardiner, the last rider to bridge, stay clear of the chasers to claim second, with Mark Clayon taking the small bunch sprint for third. Women’s C grade saw Isabella Commons attack get a gap, get chased down by the bunch. Then Selena Boddington attack get a gap, get chased down by the bunch. This went of for a couple of laps, before Commons got clear, Boddington was chasing her and the other riders were left in their wake. Commons increase her lead every lap and took the win. Boddington chased all race and was rewarded with second, with Emily Washington sprinting for third. Men’s D grade was a fast race, the pace did not allow a break to form. However the constant accelerating out of the tight 180 degree corners tired the riders, with a number being dropped. With two laps to go Michael Baker attacked, he managed to stay clear. Daniel Morris took the sprint for second with Ryley Collett third. Women’s D grade,saw attacks, but everyone was chased down quickly. 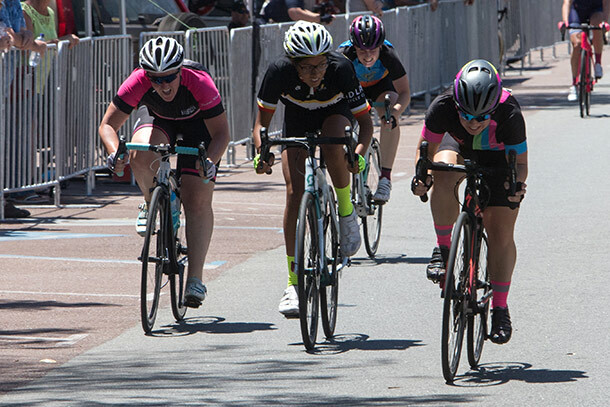 With a few riders racing their first criterium, it was a surprise to see the all the riders together for the bunch sprint which was won by first time racer Sophie Burton, with Hannah Yeo David second and Nicole Malloy third.